Answer: Journaling in Exchange Server 2010 gives us the ability to record internal and external email communication for compliance and regulatory requirements. In Exchange server 2010 there are two types of Journaling. Standard Journaling: Enable per mailbox database which capture all messages. Premium Journaling: Granular journaling, can record emails from specific users. Open EMC -> Organization Configuration -> Hub Transport -> Journal Rules Tab. Fill in the information in the Wizard. 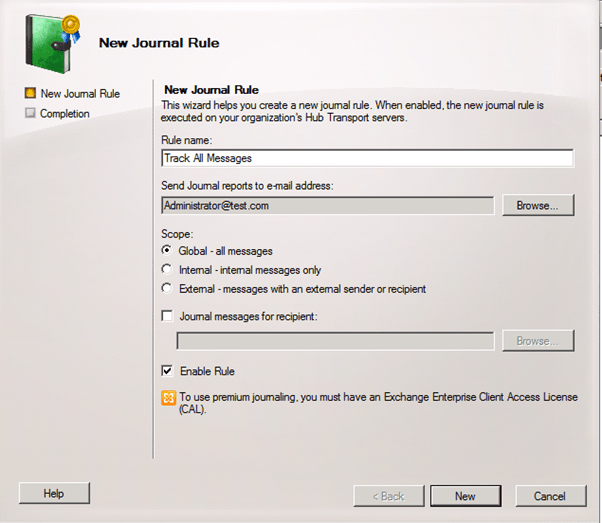 Remember that you will need the Enterprise CAL of you going to use the Journal messages for recipient option. When completed all messages that match the rule will be sent to the address you specify in the report email address. It’s recommended to create a special email address just for this purpose.